In just over an hour from Christchurch, you will find your perch above one of the most tranquil bays on Canterbury’s magnificent Banks Peninsula. 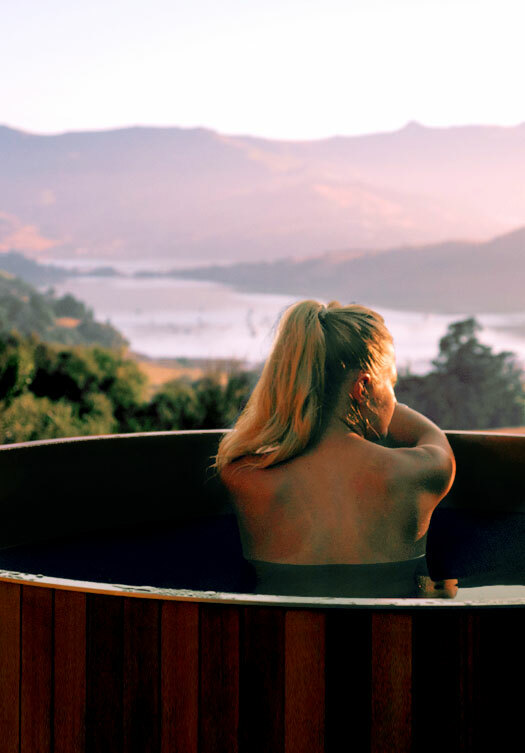 Far from the tour bus hoards, you’ll sink in to a steaming wood-fired hot tub under an abundance of stars and, if you choose, you can even enjoy sumptuous local fare delivered to your door. 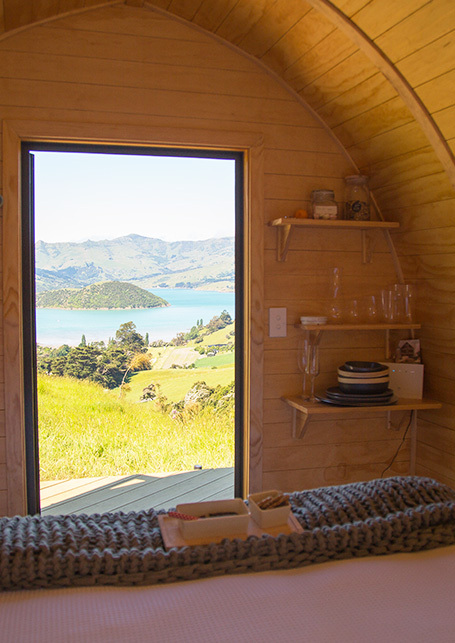 Although you’ll be a 15-30 minute hike from the nearest road - in the midst of a working cattle farm - you’ll sleep on real beds in double-glazed, New Zealand-made pods; more solid than canvas, much more romantic than an ordinary hotel room. If you’re an adventurous soul – whether travelling in a small group, on an adventure for two or flying solo – and you want an idyllic spot in which to stop, relax, read and breathe in the silence, Te Wepu is just the place. "Was an amazing place to stay! Beautiful views and the unique style of the pods nestled in the hillside made it one of the nicest places we have ever stayed! We were greeted by Kate and Richie with a BBQ hamper full of delicious fresh produce from the farm! They were very accommodating with all ours needs! It made our holiday"
"We are local farmers who had a quick escape from the kids and farm for a night at Te Wepu. Being locals we didn't think the view would still wow us but seeing it from the idyllic hot tub amongst bush and bird song made us stop and take stock of how lucky we are. We thoroughly recommend to both urban and rural for a once in a lifetime experience." "Te Wepu Intrepid Pods give you the coolest, quaintest, coziest glamping experience this side of Cook Straight. Your own nook in the native trees, a view of Akaroa Harbour, a chorus of birdsong, a private pod (comfy beds, and lovely linen! ), and your own fire-heated spa to relax into and let it all soak in. Keep your slippers clean and stick to the decked areas between the sleeping pod/spa/changing pod/fire pit or put on your hiking boots and walk to the top of the hill for an even more spectacular view. Either way, you'll sleep well here!!!"